One has only to look at the image of smoked delicacies, and immediately there is a desire to eat it all, which is quite natural for a person. Your appetite is hot? What to do now? The first reaction is to go to the supermarket and buy everything that your heart desires (and the wallet allows). 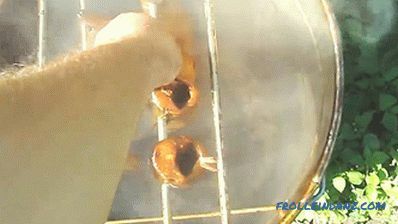 But, alas, smoked products from the store are only called, as they are treated with liquid smoke. Opinions about the benefits of such food diverge, but if there is a small plot of land, you can organize your production. 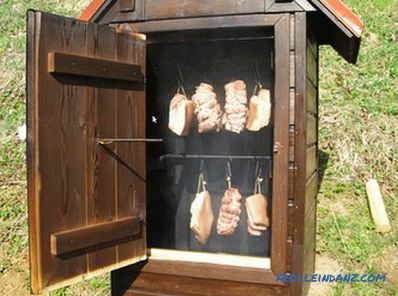 In this article we will tell you how to make a cold-smoked smokehouse with your own hands from various materials. Since it is a question of cold smoking, it is important to realize that it’s not the heat treatment of the product that is being smoked, therefore smoking should occur at a temperature of 30‒50˚C. 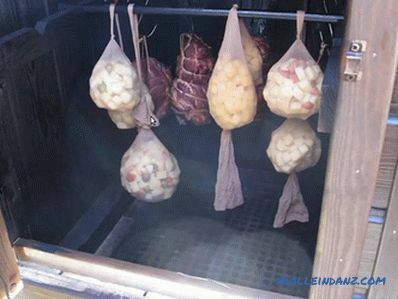 It is necessary to ensure that fumigation and heating are uniform - only in this case, smoked meats will turn out to be appetizing (meaning appearance) and tasty. Many have heard the expression "light smoke", but did not understand what was going on, or thought that it meant weak smoke, but in our case we are talking about smoke that does not contain carbon monoxide. 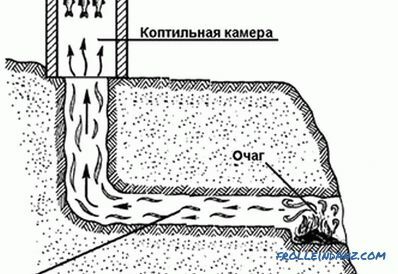 It is quite possible to achieve this by making the chimney so that this gas (with other substances harmful to human health) precipitates before reaching the smoke chamber. After mixing with the air and passing a long way through the pipeline at the exit, smoke is obtained that is suitable in composition for proper smoking. Once in the smoke chamber, the smoke must linger in it for some time and feed the products, otherwise it will be of little use. We will need a saturated salt solution, commonly called tuzluk. It is not difficult to prepare it: salt is poured into a container and stirred until it no longer dissolves. Salt is about 38-40 g per 1 liter of water. We do not need the salt that remained at the bottom - you can use it at your discretion. Now let's start salting the products. Small fish will need to keep in solution for 3 days. 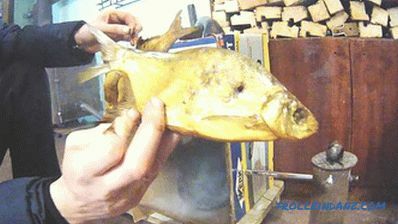 Larger fish or young pork - up to 4 days. More rigid beef meat (as well as wild boar or bear meat) must be salted for 5 days. After the salting process, we proceed to the soaking of the meat. 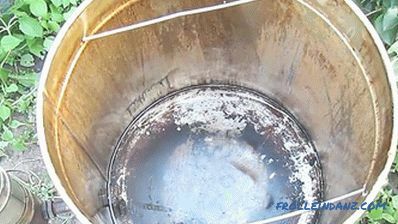 The duration of soaking can reach up to 24 hours, but here again it is necessary to take into account the type and volume of the product being prepared for smoking. 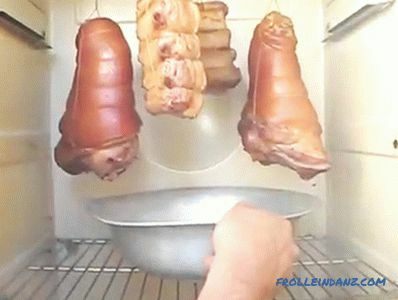 For example, it will take about 6 hours to soak a medium-sized fish, whereas pork ham will soak 2 times longer. But this time is approximate, and in order not to soak the meat more than necessary, it needs to be checked. The method is very simple: to press on the soaked product with your finger, and as soon as it starts to be easily pressed into the pulp, the process of soaking should be immediately stopped. Now the product needs to be wrung out. To do this, let the water drain from the meat, and if there is no time to wait, then you can wipe all the blanks with a towel. Paper towels for this purpose is best not to use. 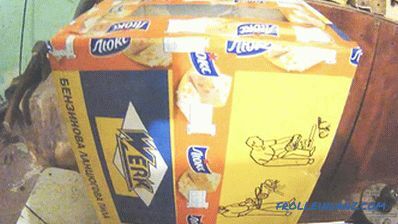 Products should be placed in a ventilated cage (or box) and protected from flies by wrapping gauze with small cells. 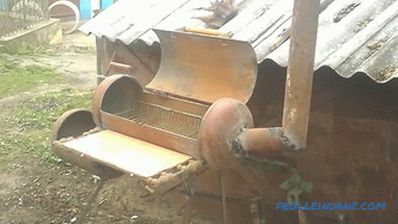 It is important to remember that there will be no heat treatment of the product, and a smokehouse for maggots is like a steam room for a person - in general, this crap is not destroyed during processing. It will take a few days for the meat to lurch. 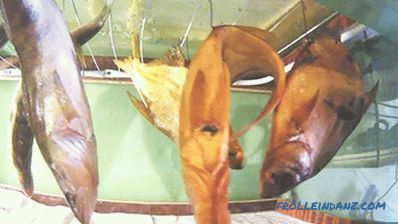 Many are well aware of what is dried fish (especially for beer), so it will not be difficult to determine when the product will be suitable for further processing. Now all blanks are hung on hangers inside the smoke chamber. 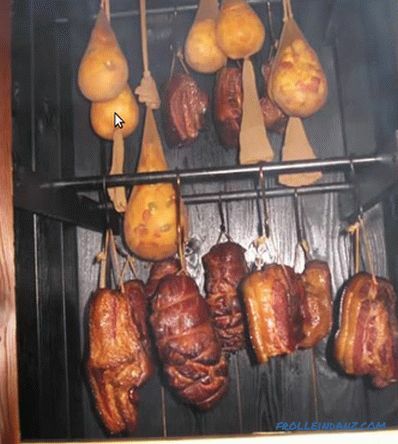 Products are ready to be smoked. 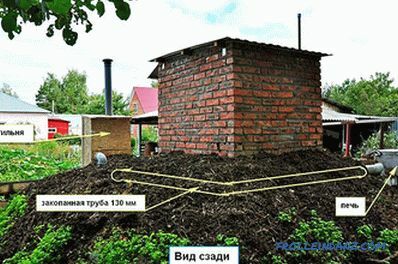 Coniferous trees and those affected by the fungus are not suitable for smoking.In addition, since the pores of the fungus are easily carried by the wind, all trees within a radius of 50 m around the infected tree automatically become unsuitable. A very good news is the fact that there is not much cost foreseen, and if the necessary materials are found in the farmer’s farm, then all that is needed is an effort. Now we proceed to production using ready-made drawings or having developed our own scheme according to our recommendations. 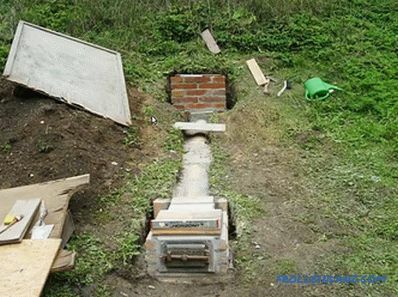 For the construction of such a smokehouse made of brick, we will use a small land plot of 4 m in length. 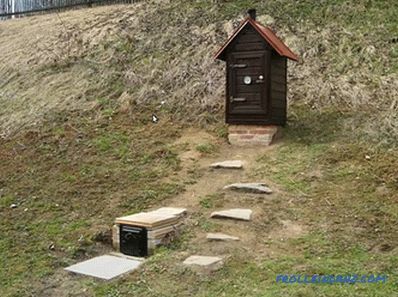 It is very good if it is possible to install a smokehouse on a small slope, as in this case it will be easier to install the chimney at the right angle. So, the site is selected (in our case on the slope), and now you can start the land works. 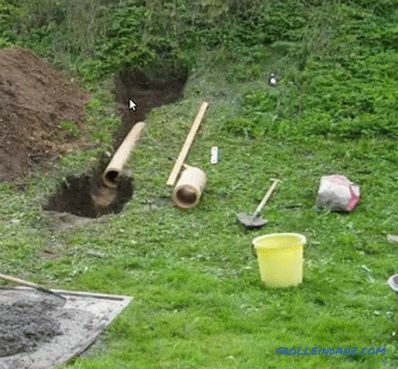 To begin with, to create a chimney you need a pipe with a total length of about 3 m and Ø1501200 mm. If so, what is its length? If 2.9 m, then do not worry. 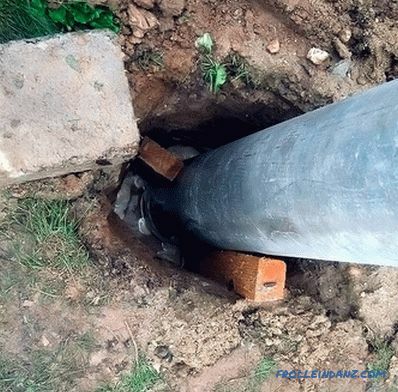 It is just that the distance between the holes must be done in such a way that the edge of the pipe does not reach the brickwork, but is inside it. 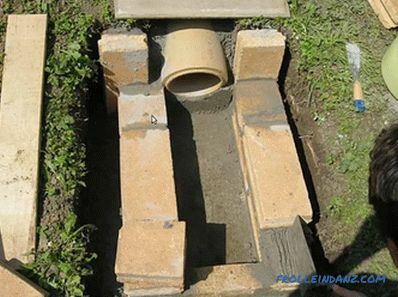 Simply put - make the distance between the pits 25-30-30 centimeters less than the length of the existing pipe. 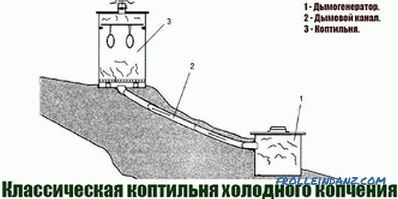 The furnace should be at the bottom, so the foundation pit for it should be done in such a way that its width will be 50 cm, length 70 cm, and the depth - a pair of spade's bayonets. 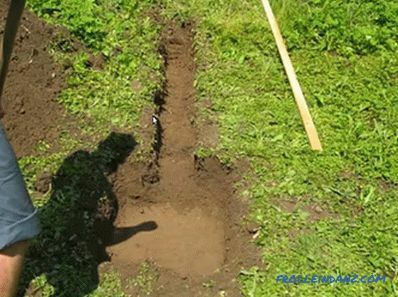 On the higher part of the slope (well, if the difference in the location of the pipe will be at least 50 cm), dig a hole 60 * 60 cm for the manufacture of the foundation for the smokehouse. Depth - a pair of bayonets below the location of the pipe. (It may be less - it all depends on the type and density of the soil, to which you have dug, but it is unnecessary to make a foundation on black soil). 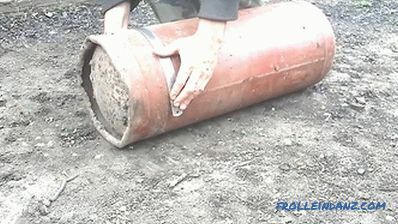 By the way, we still need clay, so we need to put it separately from the ground. 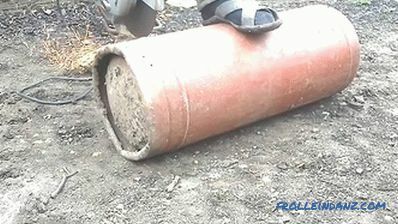 lay Dug out the pit, check how the pipe goes down and if it has not progressed to its length. If everything is in order, then you can continue to work. 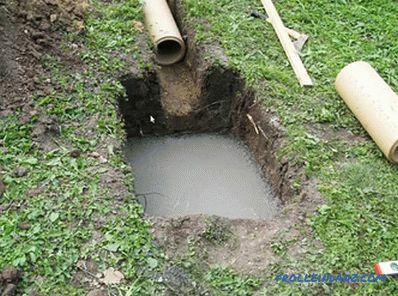 Now fill with concrete dug pits. Under the smokehouse - flush with the pipe (or slightly lower). 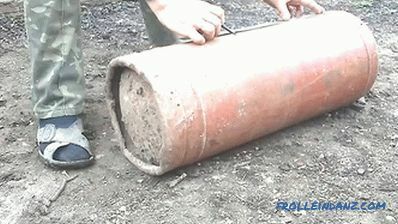 And for the firebox - 10 cm below the pipe. 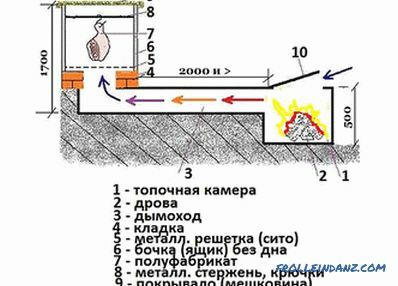 furnace as the concrete grasps, proceed to the manufacture of the furnace. Knead low-fat solution of clay, lay it on the foundation. 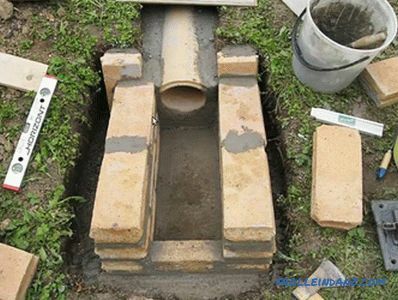 From above, along the length of the entire furnace, we will lay down the refractory brick, laying it flat on the mud solution so that the base is under the pipe. 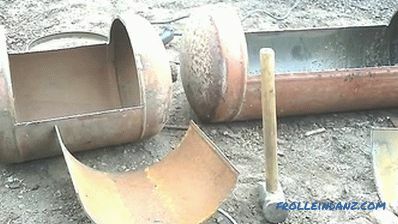 This pillow will be the base of the firebox, so we will build a firebox on it, as shown in the photo. 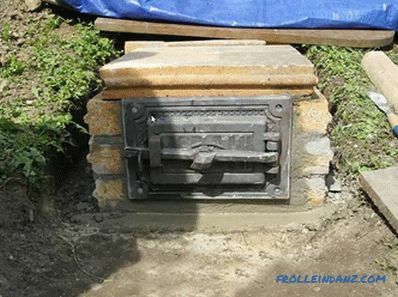 Some people prefer to use cement-sand mortar for masonry, but this is not the best option, since the bond between the bricks will be broken if there is a lot of heat. 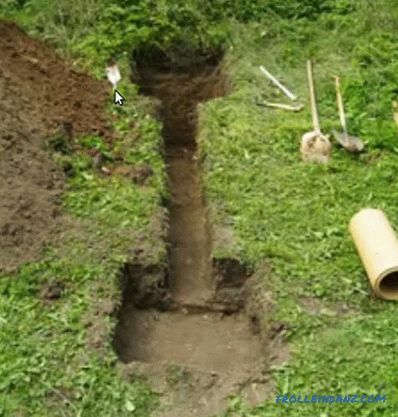 Having laid out the walls, we will provide a good heat transfer from the pipe to the ground, sprinkling it with clay. 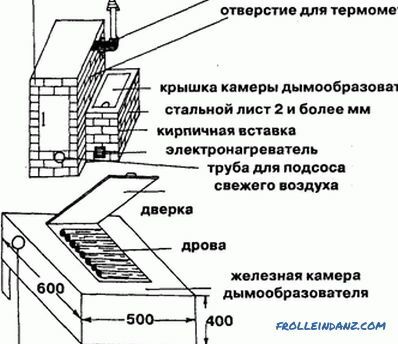 By the way, if there is no suitable pipe, then the chimney can be laid out of red brick. 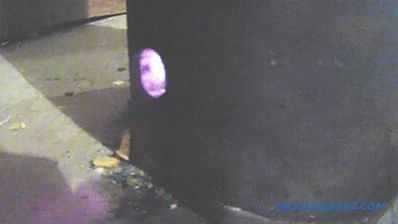 Good , if the cast-iron door is in advance, then the size of the firebox is adjusted to it. After installing the door cover the oven. We had a plate of a suitable size, but if there is none, then you can lay down the armature and make a cover of refractory bricks. 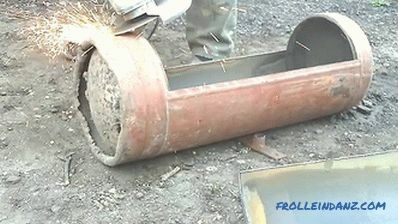 Now we proceed to the manufacture of a tubular base under the smokehouse. 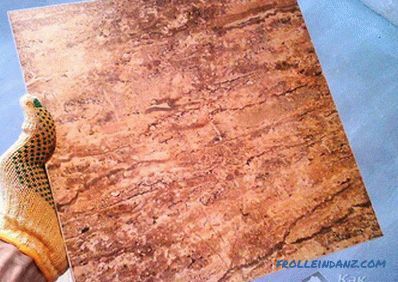 Its size is 50 * 50 cm, and the laying will be done with a simple red brick on a cement-sand mortar. 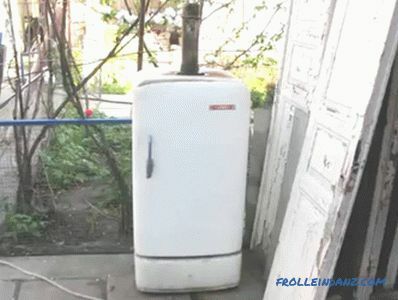 This structure should work. The height of the base is slightly above ground level. Perform a test kindling - everything works fine! 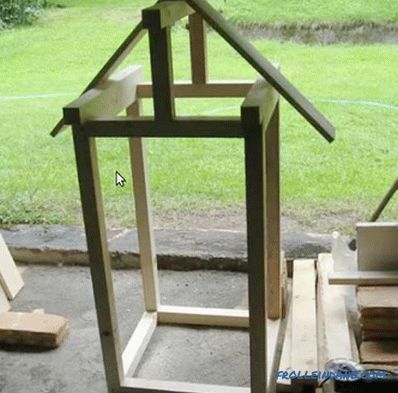 Now we proceed to making a smokehouse, the dimensions of which will be 60 * 60 cm. For the manufacture of the frame we will use 4 * 4 cm bars. On the finished frame in a vertical position, we will nail the first layer of the boards. 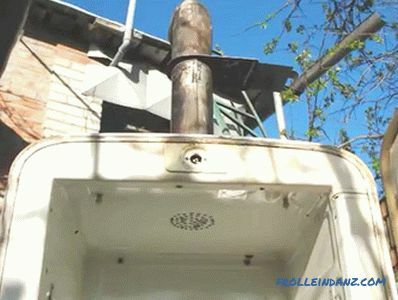 Install a metal chimney on the roof. 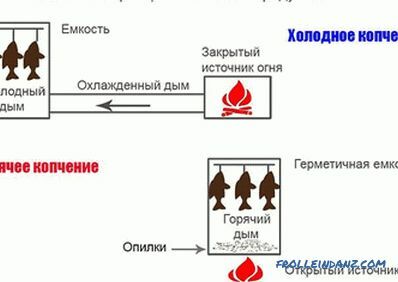 In this case, the tree does not need protection against fire, as the temperature of the smoke is very low. Since we have planned that the products will be suspended, then the sides will need to fix the boards with cut-out slots for metal bars. V As the second layer, lining of coniferous wood will be used; we nail it in a horizontal position. The same goes for the door. 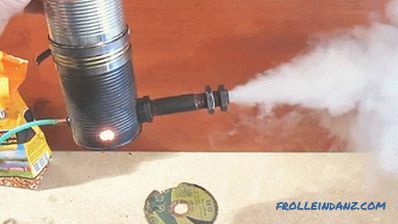 Such a device will help minimize smoke losses. You also saw a pin sticking out of the door in the previous photo - this is part of the thermometer. Its dial is located outside, so you can control the process of smoking. 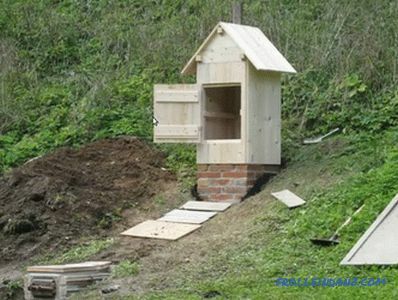 It is time to put everything together, for which it is necessary to fix the smoking shed on the brick well. We remember that the base was made 50 * 50 cm, and the cabinet was 60 * 60 cm. 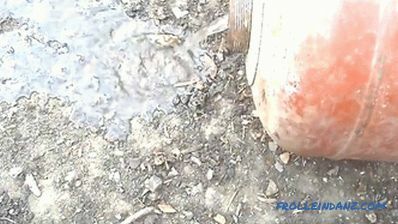 This was done deliberately so that no water would get inside the base. For its fastening we will use metal dowels, fixing through the lower bar to the brick base. There is also an alternative option - to attach metal corners to the base, and a cabinet to them. 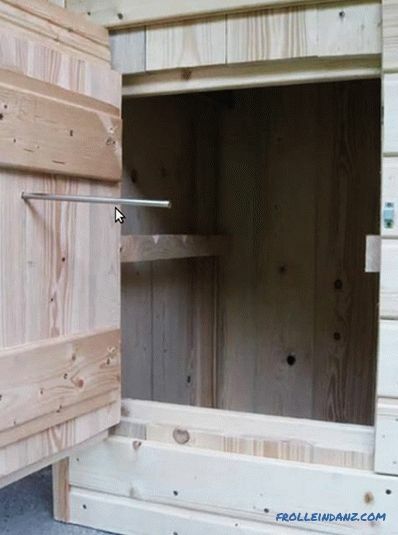 All available slots are plastered with mortar. 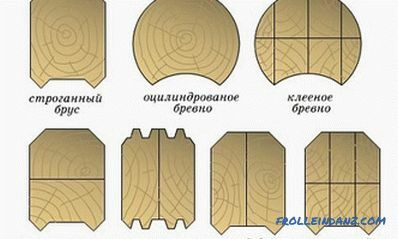 At the end of the work, it remains to open the wood with a protective agent and cover the roofing sheet with a professional sheet or metal tile. It remains to be tested. 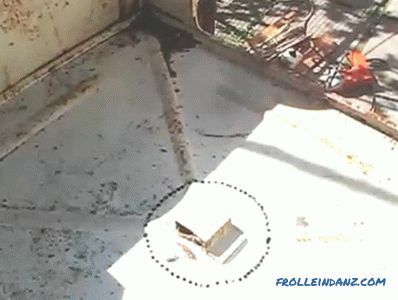 A grid of Cases are different, so it is better to be safe, putting a metal grid on the base - even if some product falls off the hook, it will not fall to the bottom, and its smoking will continue on this protective device. 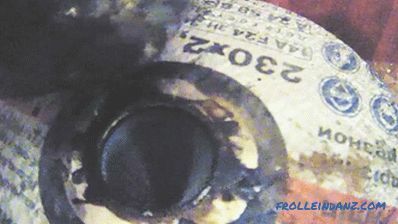 is burning in the firebox We already talked about which tree can be used for smoking. 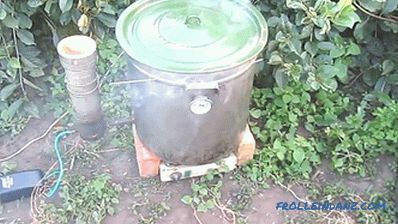 Do not neglect the advice of people who have been preparing food in this way for many years. 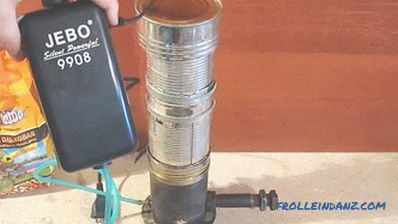 Kindle stove. 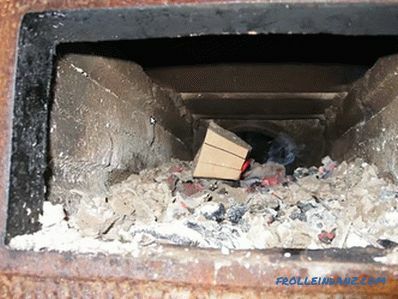 Smoke is going well, so you can close the door, not forgetting to control the temperature inside the smokehouse. 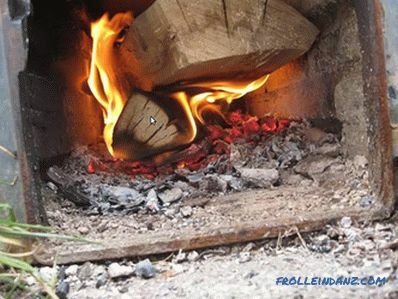 Do not forget to check the firebox and toss firewood. 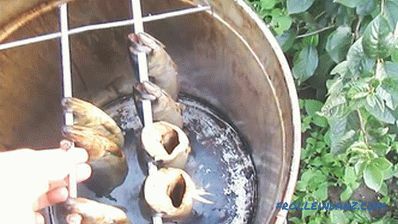 And here , the smoking process is completed - the products are ready to eat. 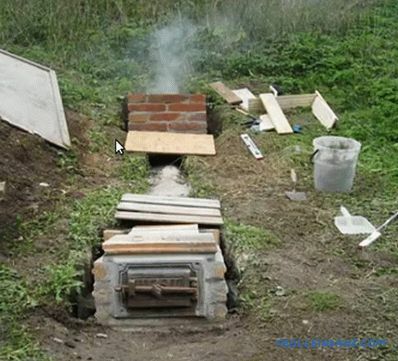 The space around the smokehouse can be ennobled by making a path. 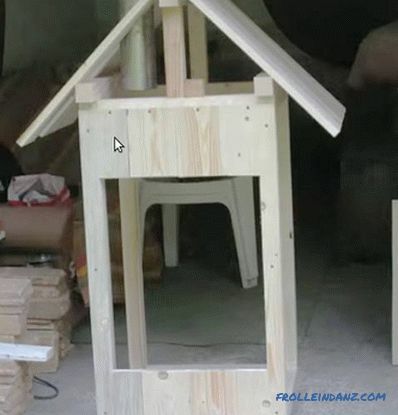 Of course, you can use any barrel for our design, instead of a wooden smokehouse, but this would simplify the design a little. 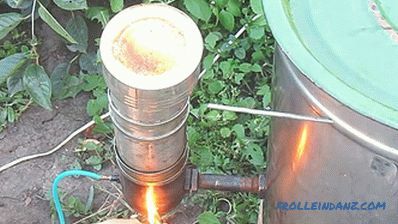 You can make a smokehouse out of a barrel more compact, even portable, only in this case you have to make a smoke generator. 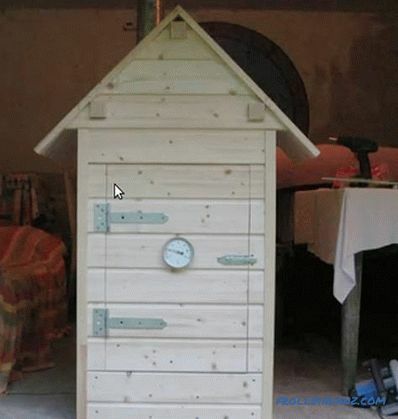 The described construction will be assembled from what is on the farm, but if the necessary parts are not available, you can cheaply buy them. 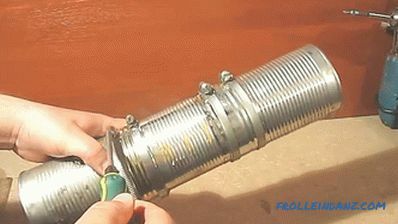 We used 4 tin cans of pineapples and a piece of copper pipe to assemble the smoke generator. 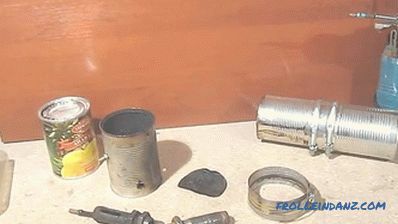 Were also purchased 2 sgona on a quarter-inch with nuts and 4 metal straps on the size of the cans. 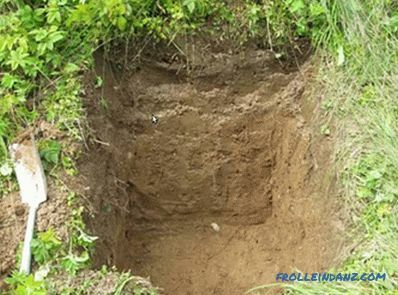 In the bottom of the bank will make one hole for sgon. 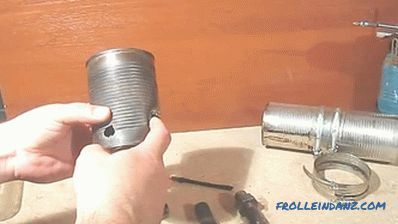 The second hole of a smaller diameter will serve as a pilot. The third hole is made according to the size of the copper tube of small diameter opposite the first hole. A little bit later we will look at how this design can be improved. 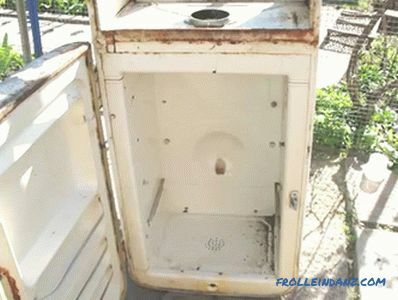 If you choose the second option, this hole (and the copper tube itself) will not be needed. 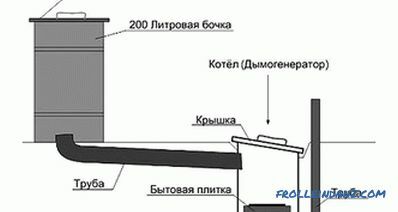 One of the sgonov will be inside the bank, reaching its edge. In it, with a grinder, we will cut a notch 4 cm long and about 8 mm wide, as shown in the photo. 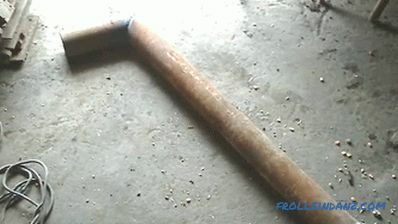 The copper tube should not fit tightly in the boom. And it should not be short. 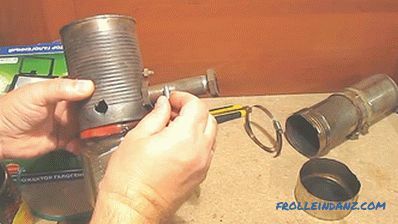 Having fixed the first sweep, fasten the second to it and insert the tube. To prevent the groove from clogging with sawdust, we will install a metal shield made of thick metal from above (possible from a pipe). 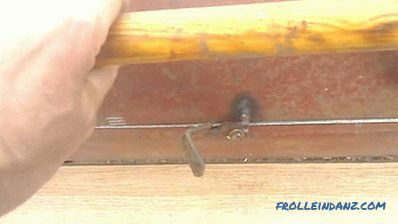 This protection should be above the rail, so its fixation can be ensured by bolting the support bolts to the bank in the right places. 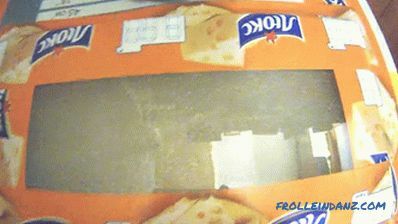 By placing inside flap, you can move on. 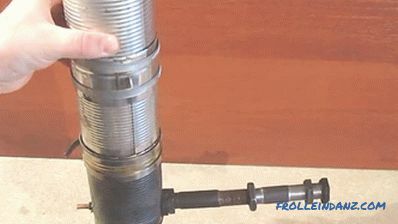 The generator itself will consist of three cans, and the fourth will be cut into strips, we will wrap the cans with them and fasten them with clamps. 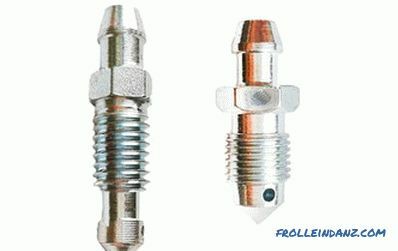 If the need arises, then you can always increase the tube, but we advise you to use a coupling for the connection, and not a nut. 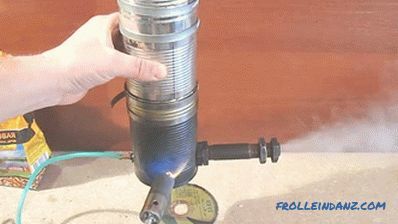 For our design, we will use an aquarium compressor with an adjustable amount of air supply. Now poured inside the chips. 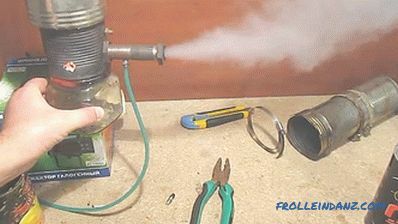 Turn on the compressor and ignite the chips. 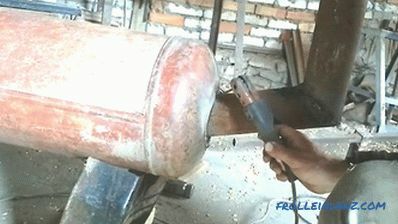 By adjusting the depth of the copper tube, we perform the adjustment, ensuring that there is as much smoke as possible. Now we will look at how this model can be improved, since this modification will help reduce the temperature of the smoke. 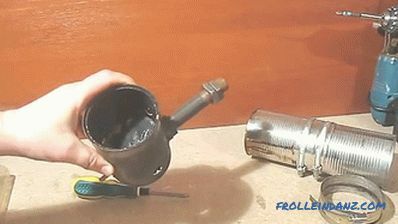 You can also take care that the ash is poured out of the generator, and not accumulated in it. 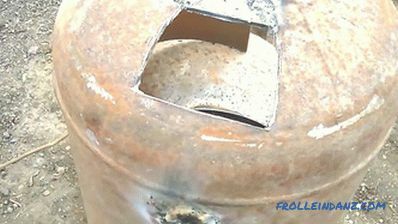 In this construction there will be no inner tube - the thread is screwed to the edge of the jar, and in order to avoid sawdust, we will make a petal of tin from the inside, having made many small holes in it. Bottom to the jar fasten two bolts twisting lid from the glass jar, and then we drill a lot of holes. It will be enough Insert the jar, slightly turning it, and the hermetic ash collector is ready. As we have already warned, there will be no copper tube in this structure, air will be supplied through the outside of the tower. 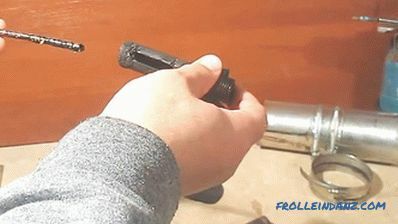 To do this, we use the purchased (or used) fitting to release air from the brake system (preferably from a domestic car, since it is cheap). 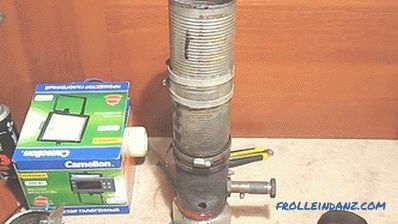 To do this, it is necessary to drill a hole in the sgon, and, having selected a suitable tap, cut the threads. 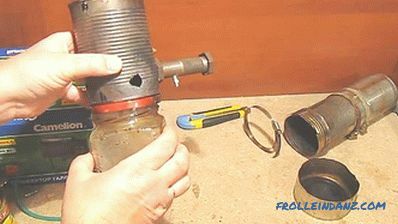 At the top of the valve there is a side opening, if it is small, then it should be drilled out to Ø2 mm. 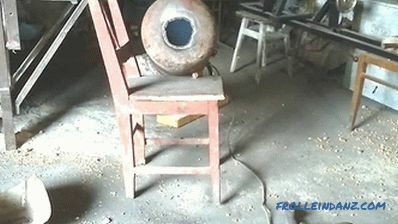 After screwing it in, the hole should be directed towards the smokehouse. 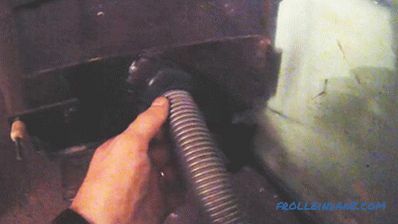 This fitting is specially made so that during pumping the brakes it can be pulled on the rubber tube, so there will be no problems with connecting the hose from the compressor. 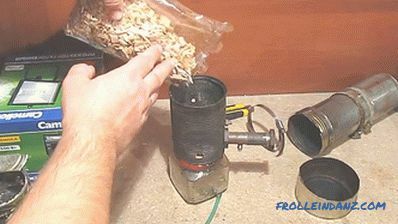 Now you can fall asleep wood chips and set it on fire. 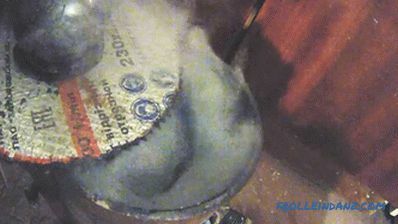 Tests have shown that the system runs smoothly, producing the right amount of smoke. 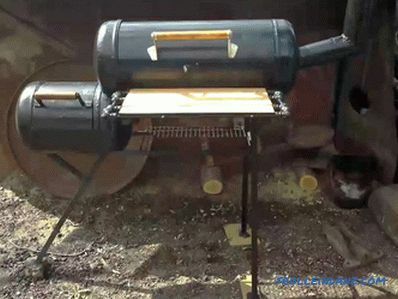 And so the generator is assembled, it remains to connect it to the barrel (or other capacity), and you can smoke the products. Fish soaked and ready to smoke. In order for the brining and soaking process to occur evenly, the products must be completely immersed in the liquid. In our case, we achieved this by flattening the fish with a plate. 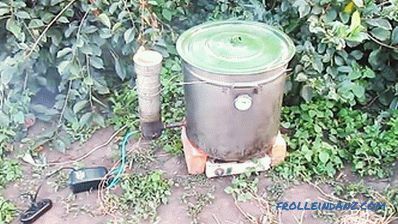 Gas generator connected to our small barrel (or large saucepan) and ready to run. 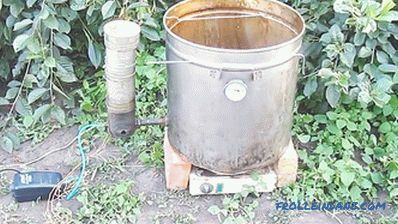 Although cold smoked produces little fat, it is better to install a suitable container at the bottom to collect it. 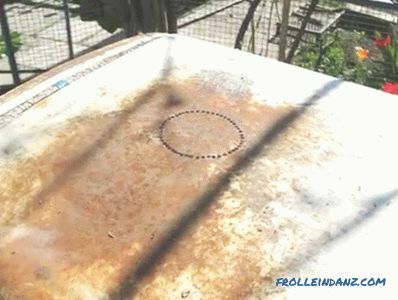 In order to be able to hang the products, we drilled 4 holes in our tank and inserted thin reinforcement into them. If it is cool outside, the capacity can be slightly heated with an electric stove so that the temperature inside the smokehouse becomes acceptable. 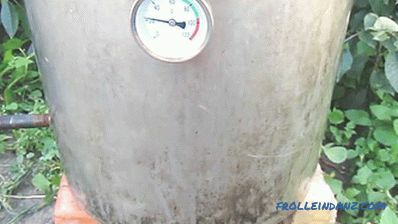 A thermometer installed in the tank will help control the smoking process by adjusting the temperature inside it. were used for the products The fish was put on old skewers, from which plastic handles were removed. 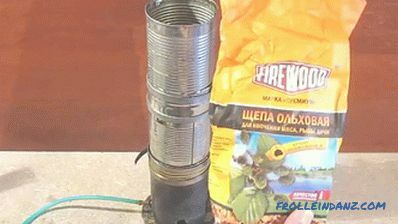 Now we pour chips into our gas generator. 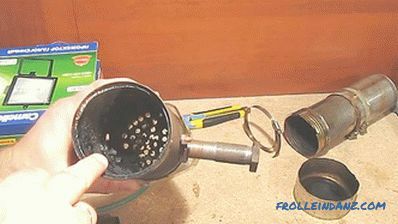 Covers cover, turn on the compressor and ignite the chips. From under the unpressurized lid seemed thick with smoke. Through The window intended for ignition clearly shows that there is a good heat in the gas generator. Now it remains only to wait, periodically adding chips and monitoring the temperature inside the tank. Smoking was done , and now the fish is ready to eat. 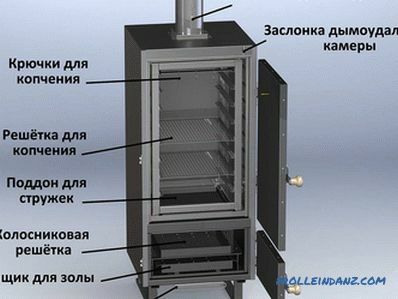 Depending on the volume of products you intend to smoke regularly, a suitable container is chosen - a saucepan or a barrel of 100‒200 l.
The design of this smoke generator will only work in conjunction with a smoke chamber equipped with a chimney. 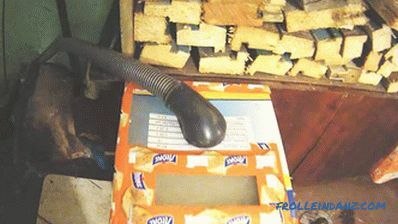 As a smoke chamber, we will use an ordinary packing box of a chainsaw, carefully wrapped with tape. Inside we fix the frame of the bars, and on it stretch the rows of wire so that you can hang the fish. 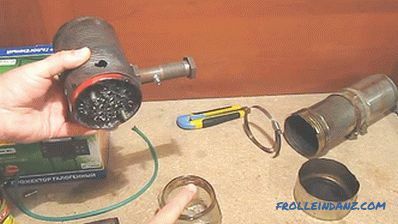 It looks like gas generator. 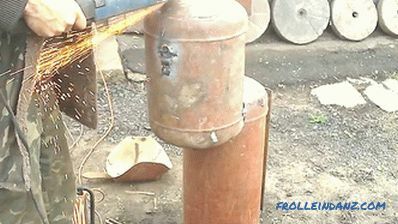 loaded with wood chips and set on fire. Instead of a lid, we use a trimmed disc from the grinder, and close the hole in it with a metal ball, which will also serve as a weight. 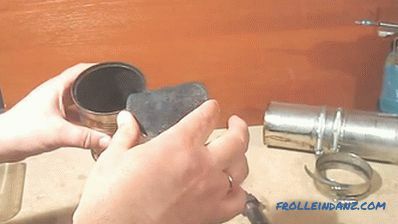 In order for smoke to not enter the room through such a cover, the edge of the pipe must be cut off very precisely. 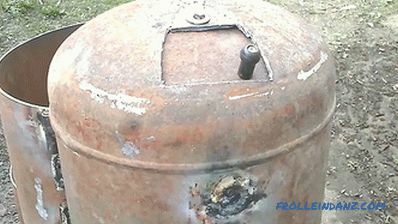 To check if there are chips and smoke in the gas generator, just remove the ball and look inside. Well, if you move the lid off, you can see that there is plenty of smoke. Project author is installed I installed a viewing window in the smokehouse to monitor the process. 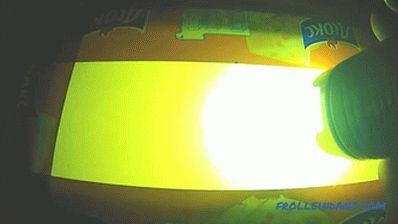 The idea turned out to be empty, since due to the thick smoke inside the box, it is impossible to see anything, even highlighting a flashlight. 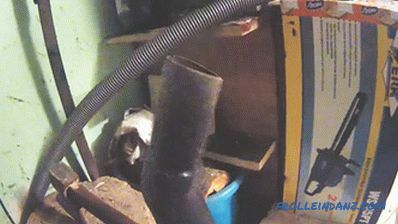 A pipe from a vacuum cleaner is used as a chimney. 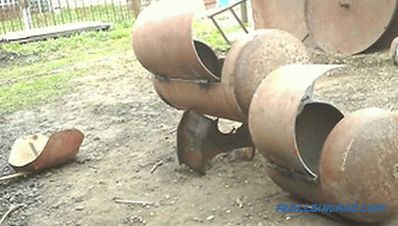 The chimney turned out to be long and curved, but this did not affect the operation of the gas generator. 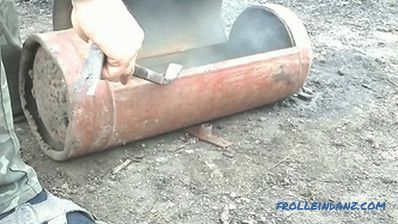 The second end of the pipe is inserted into the furnace. 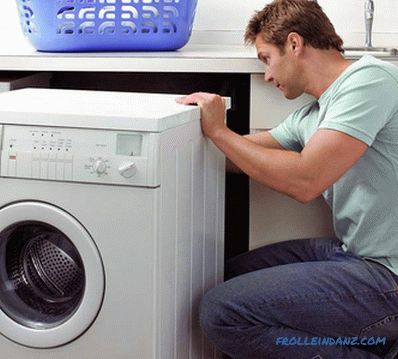 It is necessary to check that all the oven doors are tightly closed and there is no air leaks, otherwise the gas generator will not work. Traction is ensured by the fact that the chimney stove is significantly elevated above the room. 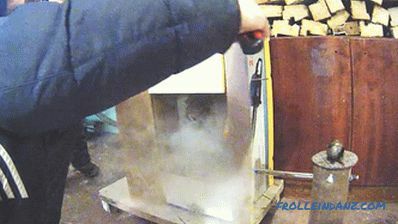 At the end of the smoking process, the tape is cut, and the casement flaps open. Low cost, and we have delicious food. 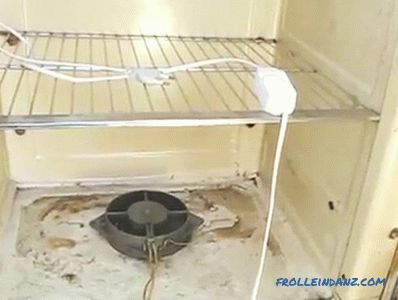 If there is an old refrigerator with a whole body, it can also be used by connecting a smoke generator to it or by supplying smoke from a homemade stove. 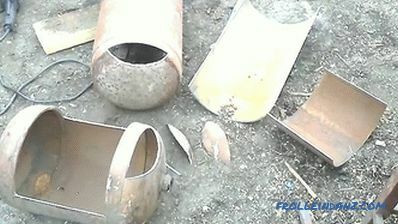 For the manufacture of the furnace was used the old household gas cylinder from liquefied gas. 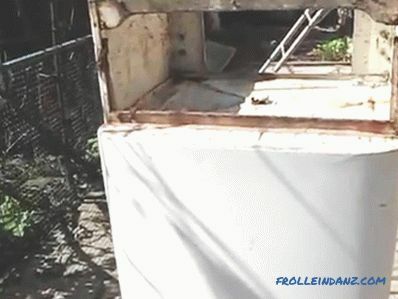 Found and the old refrigerator. We turned it upside down, removed the compressor and set to work. 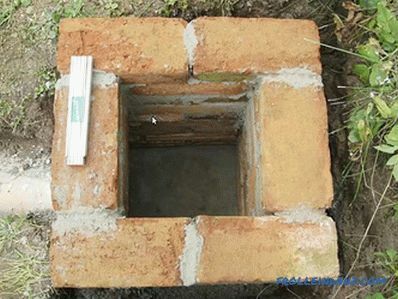 A hole should be made in the bottom of the cooling chamber to connect the chimney. 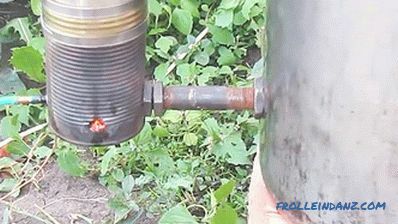 To do this, they outlined a circle of the required diameter and drilled a lot of holes along the line with a Ø4 mm drill bit. Then make a hole in the inner lining. 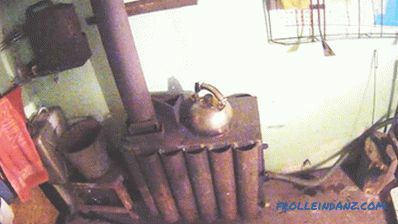 If the thrust is weak (and this can also happen due to the fact that the chamber turned out to be leaky), a fan can be inserted in the bottom, which will draw smoke from the firebox, feeding it to the smokehouse. 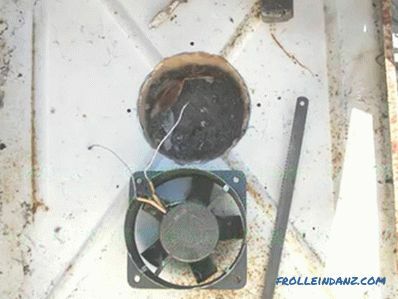 In order to be able to regulate the force of thrust, and the temperature inside the chamber, it is possible to connect the fan through the voltage regulator. In the upper part (in the photo it is from the bottom), we will drill a lot of holes so that smoke can escape through them. 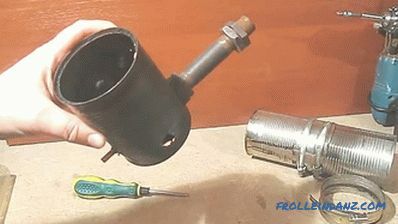 Outside, we will also make a hole for mounting the exhaust pipe. 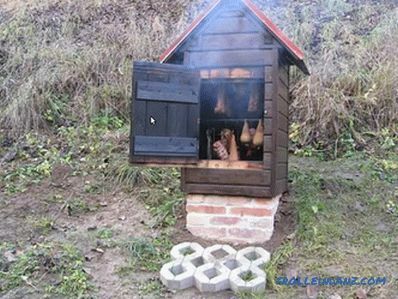 Here such a smokehouse turned out. 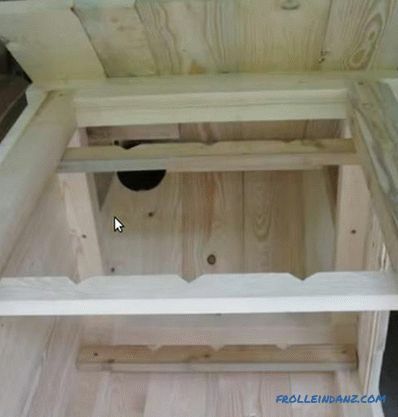 Now you need to install the structure higher and connect with the furnace. 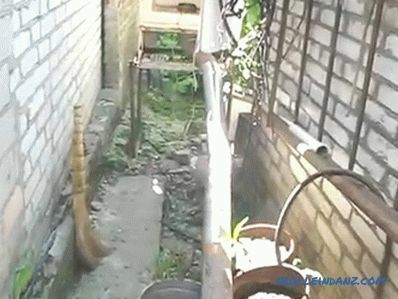 The length of the pipe turned out to be considerable. 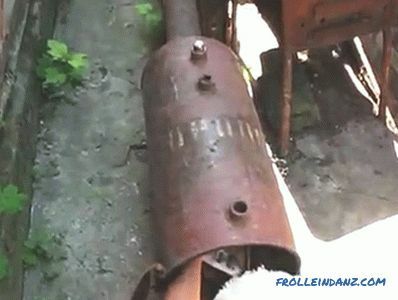 Now we will put firewood and melt the firebox. Smoke goes well, so you can smoke. 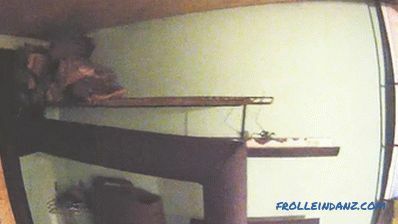 Hanging products, set the tray or bowl, which will drain the fat. We close the door and wait for the allotted time. 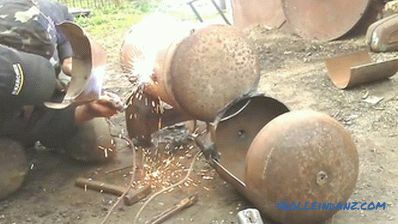 First of all, let's talk about safety, as cutting a gas cylinder without first preparing it is very dangerous. Watch the tutorial on this topic. As already mentioned, the balloon must be properly prepared. Now you can proceed to markup. Round parts conveniently mark by attaching a metal meter. 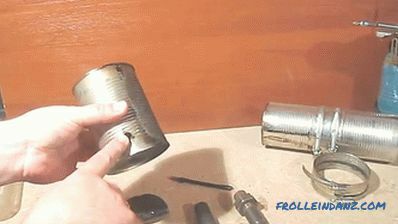 Now You can begin to cut in the cylinder hatch using grinders. It is advisable not go beyond the markup, but in this case you will have to cut the part out with a crowbar in order to extract it. This is what should happen. 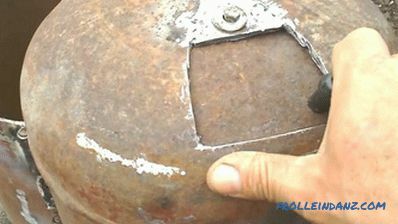 As can be seen in the photo, the cut was performed near the welds - where the metal is thinner. 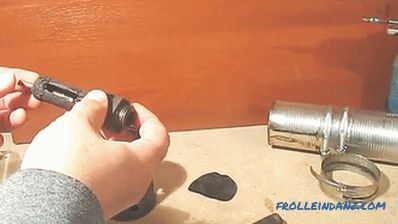 At the bottom part of the balloon is welded "sole", through which it becomes stable. Since we do not need it, we will cut off this part. 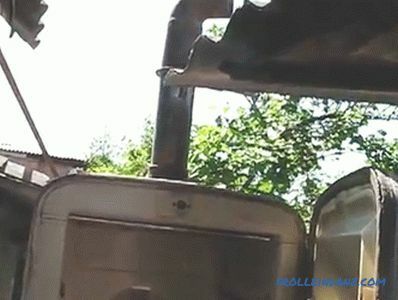 As a smoke generator, we will use a receiver from a truck. 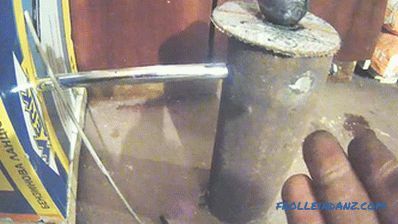 It does not contain explosive vapors, so you can cut the door without preparation. 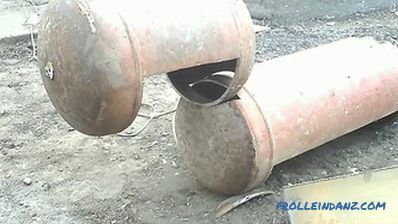 On the same side where the door is cut, on both cylinders we cut out openings, the radius of which should be as close as possible to the diameter of the other cylinder. We check how tightly they fit together, and if necessary we adjust. 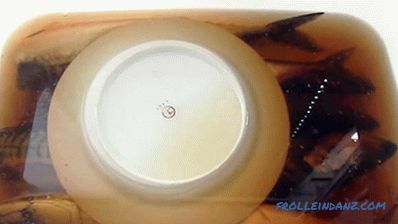 Now all the seams need to be thoroughly boiled. Doors must open without sticking, and when closing close the door tightly. 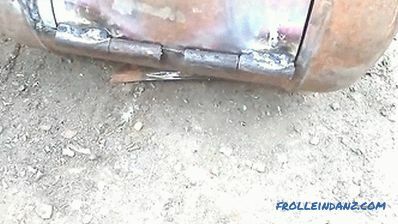 By the way, from the inside you can weld a stop, if the door falls inside. From the end of the receiver make a hole for the valve. 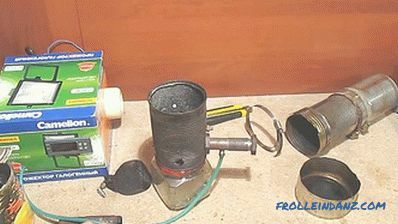 It will be small, as it is needed in order to regulate the flow of air inside the smoke generator. 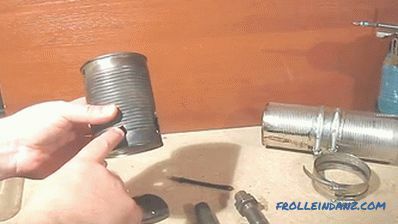 Then we take a larger piece of metal and make a valve out of it, securing it to the top of a bolt with a nut. It is not necessary to tighten the fasteners, since the valve needs to be moved from time to time, changing its position, therefore we tighten the locknut over the first nut. 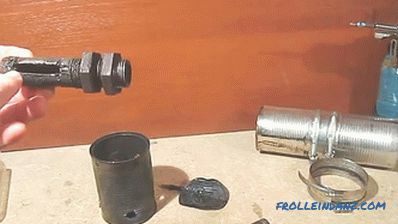 The valve should move to the side with some force. 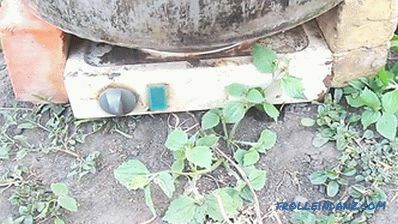 As you can see, a plastic handle is screwed to it, but practice shows that it is also very hot, so you can weld a piece of bar. 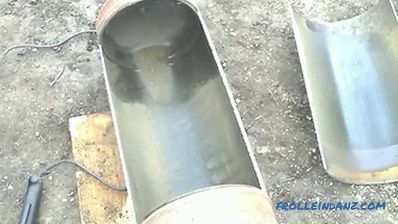 We are engaged in the manufacture of the chimney, welding it at an angle of two pipes. As for the corner, it does not need to do 90˚ - it must be unfolded. Apply the markings on the balloon, outlining the pipe scriber or marker. 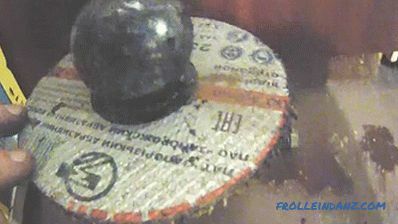 Drilling such a hole is very tedious and expensive, so it’s best to do this with a cutter. 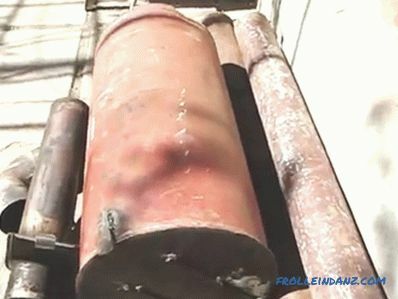 If there is none, then many people cut the hole with an electrode, setting the welding machine to the maximum current. 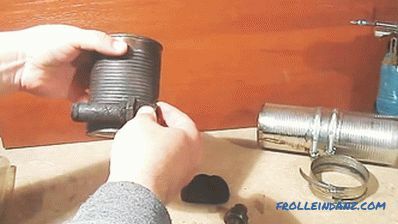 after Once the pipe is inserted, its position must be adjusted and then welded. Very it is convenient if the covers are secured with handles on a wooden base, as if you touch them you will not get burned. K the smokehouse was welded on legs and a table on which it would be possible to put dishes with products prepared for smoking. 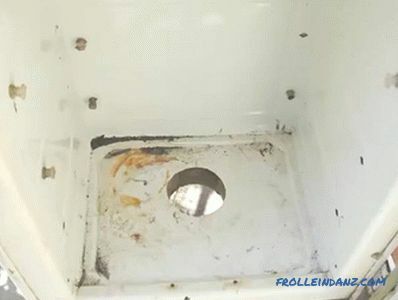 Inside, we will install the grate from the old refrigerator, bending it to the size of the bottle. 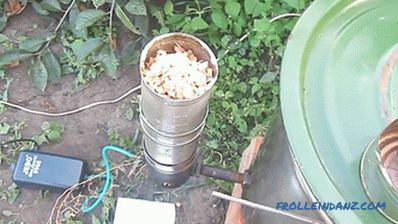 It remains to charge the smoke generator, put the food on the grid, and you can smoke. 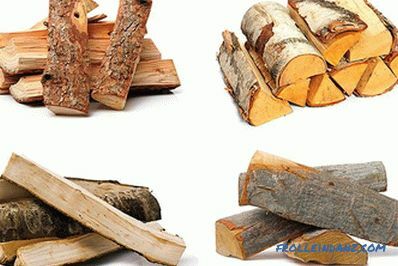 It is important to monitor the smoke generator - firewood or wood chips should smolder and not burn. The considered methods of smoking products allow you to prepare high-quality food that is not harmful to the body. We do not claim that smoked meat is good for the human body. However, products prepared in some ways are obtained in such a way that the experts of this business will not even touch them. Watch a video on this topic.